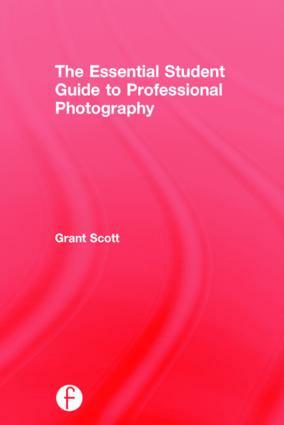 This essential reference for photography students explains how to become part of the professional community. By defining professional photography today, and exploring what is expected of professional photographers, the book demystifies this often-misunderstood and misjudged career track. The easily accessible text provides readers with valuable information, inspiration, and education on topics including developing your photographic voice, finding your area of specialization, exploring the moving image, building a website, and understanding self-presentation, promotion, legal aspects, and marketing. It also features inspirational projects for students to embark on their education in photography. Chapter One: What Is Professional Photography? Chapter Two: What Makes a Professional Photographer? Chapter Five: Going It Alone and Where Do You Fit? Grant Scott began working as a professional photographer in 2000 after working for fifteen years as an art director of photography books and magazines such as Elle and Tatler. His images and photographic narratives bring together his experience working with some of the greatest photographers of the last century with his graphic and journalistic talents. He has edited Professional Photographer, Photography Monthly, and Turning Pro magazines in the UK and is now a freelance photographer and senior lecturer on the Editorial and Advertising Photography BA Hons degree course at the University of Gloucestershire. He is also the founder and curator/editor of www.unitednationsofphotography.com. His photography monographs include, At Home with the Makers of Style, Thames & Hudson, 2006 and Crash Happy, Café Royal Books, 2014 and his work is held in the permanent collections at MOMA, New York, Tate, London, Victoria & Albert Museum, London and the British Library. He is also the author of Professional Photography: The New Global Landscape Explained, published by Focal Press in 2014. In 2015, he was made a Fellow of the Higher Education Academy in the UK.